How do you find the vertical asymptotes of this function? I set the denominator equal to zero and get x = 1 or x = -1 read more .. Given and , decompose into two vectors and , where is parallel to and is orthogonal to read more .. This question tripped me up at first but then I figured out the correct answer. I thought it was a neat question if anyone wants to try it just for fun. Imagine that you are locked in a room with only these things: some sacks of some gold coins, a penny scale, and one penny. The exact number of sacks does not matter, and the exact number of coins in each sack does not read more ..
A motorboat goes 5 miles upstream in the same time it requires to go 7 miles downstream. If the river flows at​ 2mph, find the speed of the boat in still water. Determine convergence or divergence of the series. I'm trying to understand this example in my book but I don't know how they got from one step to the next. The height of a sphere would be its diameter. Let's call this " d " . Divide both sides by pi . To solve this equation for n , first let's subtract 10 from both sides. Next, divide both sides of the equation by -3 . Next, subtract 6 from both sides of the equation. First let's evaluate the function for x = -3 . To do that, replace every instance of " x " with " -3 " . Multiply 4(-3) to get -12 . Combine -12 and -1 to get -13 . Now we don't need to keep the parenthesees. So...the value of the function when x = -3 is -13/3 . Divide the numerator and denominator by 4.6 . The area of the lawn is just the area of the backyard minus the area of the pond . Plug in the information given in the problem. c does not apply to a and b , c applies only to b . 2x + 9 = 35 Subtract 9 from both sides of the equation. 2x = 26 Divide both sides of the equation by 2 . I don't really know the best way to do these, but someone else probably does. (2n - 3) / 5 = 5 Multiply both sides of the equation by 5 . 2n - 3 = 25 Add 3 to both sides of the equation. 2n = 28 Divide both sides of the equation by 2 . 6(d + 1) - 2d = 54 Distribute the 6 to both terms in parenthesees. 6d + 6 - 2d = 54 Combine 6d and -2d to get 4d . 4d + 6 = 54 Subtract 6 from both sides. 4d = 48 Divide both sides by 4 . -140 = 18 + 4(5y - 2) Distribute the 4 to both terms in parenthesees. -140 = 18 + 20y - 8 Combine 18 and -8 to get 10 . -140 = 10 + 20y Subtract 10 from both sides. -150 = 20y Divide both sides by 20 . First, let's connect the points of tangency to each other to make a triangle. To find the area of each segment, let's draw a circle that is a part of one of these arcs. Then draw two radii to the points of tangency. this is an equilateral triangle where each angle is 60° . So, the purple sides also are 4 units long. 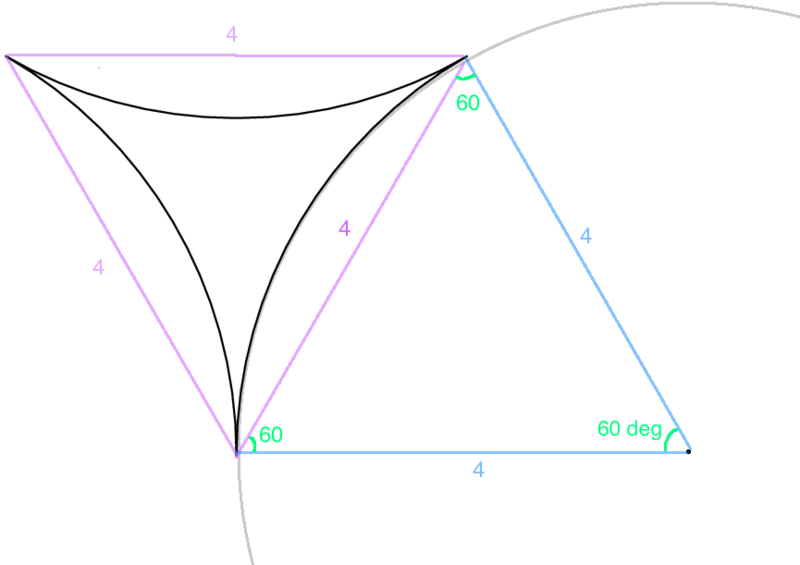 Now, we just found the area of the triangle inside the circle = 4√3 . The area of the triangle outside the circle is also an equilateral triangle with sides 4 units long, so its area also = 4√3 . You can solve for x with the quadratic formula as Guest said, or you can factor the expression on the left side. To factor it.....you need two numbers that add to -2 and multiply to -3 . Here's an example that might help without giving away the answer. Now set each factor equal to zero and solve for x . So x = 4 causes this expression to equal zero, and also x = 2 causes the expression to equal zero.